Once you’ve made the decision to seek a permanent solution to hair loss or thinning hair, you’ll likely have a number of questions. That’s why RHRLI will take you through every step of our state of the art hair restoration treatment, the ARTAS® System. We’re the only hair loss treatment center on Long Island that employs this procedure that uses robotic technology to give you a healthier head of hair. ARTAS® is also minimally invasive. We’ve got you covered with the most accurate hair transplant system available and we’ll explain it to you. But we also know that you’ll have questions about what happens after the procedure is done. RHRLI understands you’ll want information about how to care for your hair after your hair restoration treatment. 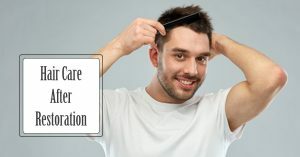 The first thing you need to know about taking care of yourself after you’ve had your hair transplant is that your recovery time will be quicker. That’s because transplants with the ARTAS® System are virtually painless. It doesn’t require surgical incisions or stitches. It’s an outpatient procedure which requires only a local anesthetic. While you may experience a little bit of swelling, it should go away in about one to three days. At the time you begin recovery, you will be given information about any medications you need to take. According to a brochure on the procedure put out by ARTAS®, you will also be given instructions about sleeping and any behavior modification you might need to make like protecting your scalp from the sun. If you do experience some pain, you likely will be told to take acetaminophen. On the first day after the procedure, you can use baby shampoo. You should be careful to use a low-pressure shower head or better yet, put water into a cup and gently pour it onto your head. Be sure to use cool to lukewarm water while rinsing. When using the baby shampoo, lather a dime size amount onto your palms and lightly pat the shampoo onto the grafted areas. To avoid manipulating the graft area, lather the surrounding hair. Then allow the lather foam to cover the transplanted area so the suds and the water wash over the grafts. Then rinse. Be sure to air dry your hair rather than blow dry it and don’t use any hair styling products on the day after the procedure or longer if your doctor has concerns. You can comb your hair, but make sure the comb doesn’t come into contact with the grafts. You should be careful about rubbing or scratching the transplanted area for three days after the procedure. On the fourth day, you can shampoo in a circular motion. You may resume normal shampooing after a week unless told otherwise by your doctor. You should also consult with your doctor about the use of other hair products and medications before resuming them. If you exercise a little care in the first day or so after your procedures, you should be back to normal soon. And with RHRLI you’ll be on your way to having a fuller, healthier head of hair. Contact us for a consultation today.